Now if your looking for a obscure horror film that many horror fans and horror websites seemingly ignored and didnt even fly under there radar from last year…one that is just a ballsy weird trip then ive got the horror for you dear horrorfiends. It is Don Thacker’s Motivational Growth and oh is this a weird one. from IMDB : Ian Folivor, a depressed and reclusive 30-something, finds himself taking advice from a growth in his bathroom after a failed suicide attempt. The Mold, a smooth talking fungus who was born of the filth collecting in a corner of Ian’s neglected bathroom, works to win Ian’s trust by helping him clean himself up and remodel his lifestyle. With The Mold’s help, Ian attracts the attention of a neighbor he’s been ogling through his peephole, Leah, and he manages to find a slice of happiness despite his unnatural circumstances. But Ian starts to receive strange messages from his old and broken down TV set that make him realize that The Mold may not be as helpful as it seems to be, and strange characters combined with stranger events cast Ian’s life in the shadow making him and the viewer question what is real and what isnt. 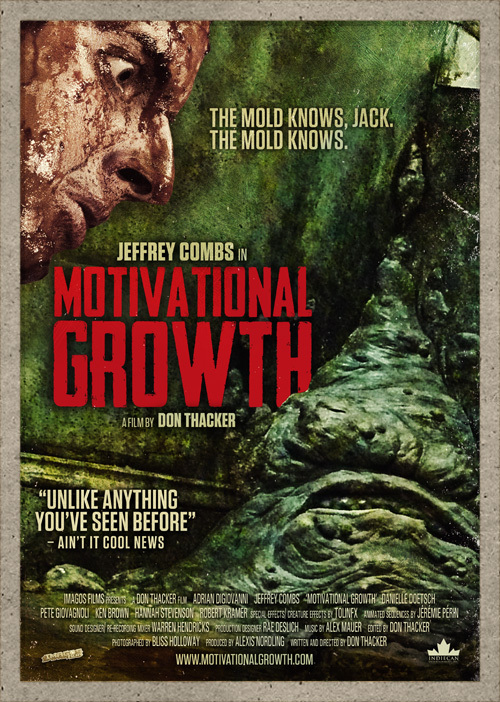 Let me just say that though one can say that in a way Motivational Growth isnt a real horror movie, it is a pretty bizarre Hyberbole of a movie. The first scenes is introducing the character of Ian as he talks directly towards the camera while in the center of his apartment almost making it feel like its all a theatrical play, and the apartment practically becomes a character in itself too because we the viewer never leave it. And when the Mold finally comes into play (voiced by the terrific Jeffrey Combs of Re-Animator fame) that is where the film really goes head first into the bizarre hyberbole nature of it all with 8-bit graphic sequence, weird things growing from the mold that alter Ian’s life, odd characters that come into the movie with strange dialogue, the Mold itself talking in riddles confusing the viewer and finally little strange things here and there that make you question whether or not everything that is happening to Ian is really happening or not. Third episode of Waugh and Coker is here! hey there Horrorfiends! there third episode of Waugh and Cokers Plugged in is here, and this time we review the underappreciated and little known troma movie DEAD DUDES IN THE HOUSE and then get killed ourselves…enjoy! We all know the horrific coming-of-age story of the shy teenage outcast Carrie, from the classic 1977 Brian De Palma adaptation of Stephen King’s first novel, to the 2013 loved-it-or-hated-it remake. But what most cinephiles may have missed is David Carson’s 2002 made-for-TV film of the same title. What De Palma purists and King lovers may find intriguing about the film is that Bryan Fuller’s teleplay is probably the closest adaptation to the source material, although a few scenes deviate from the novel, most notably the shocking shower scene that kicks the story off. 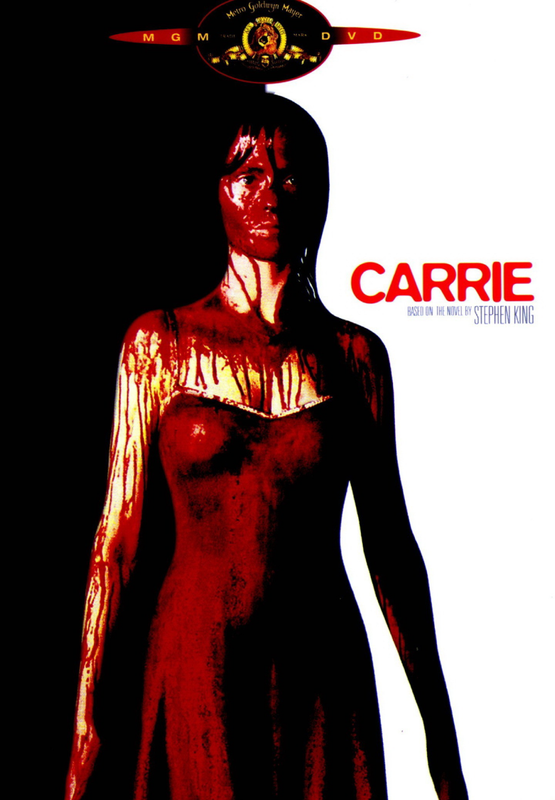 The direction and cinematography may be some of the weakest attributes to the production, but there are some strong performances throughout, most notably from Angela Bettis (May, Masters of Horror: Sick Girl) as the isolated Carrie, Patricia Clarkson (Wendigo, Shutter Island) as the God-fearing mother Margaret, and Canadian scream queen Katharine Isabelle (American Mary, Ginger Snaps) as Tina Blake. Although many of the teenagers’ performances are sometimes impaired by silly dialogue, one can bet it was due to the fact that Fuller was playing catch-up with the witty, silver-tongued teenage horror films of the late 1990s like Scream and Final Destination. All criticism aside, horror fans should check this one out, just to see a new approach to a world they already know and love. Summer is practically here horrorfiends! and for many horror fans that means summertime horror films. and what can be more of a summer time horror film then that of the summer camp slasher film, particularly ones from the 1980s. Now i know i covered “The Burning” last summer and since this blog is all about HIDDEN HORRORS i will of course never cover the friday the 13th movies because those are surely not Hidden Horrors, no this time i will be covering another summer camp slasher film that is well loved by horror fans but normal movie goers never heard of it, it is MADMAN! At a summer camp for youths, cockey pre-teen calls out the name of mass serial killer “Madman Marz”. Suddenly, counselors are being maimed and slaughtered in various ways by the backwoodsman who has returned when his name was called. 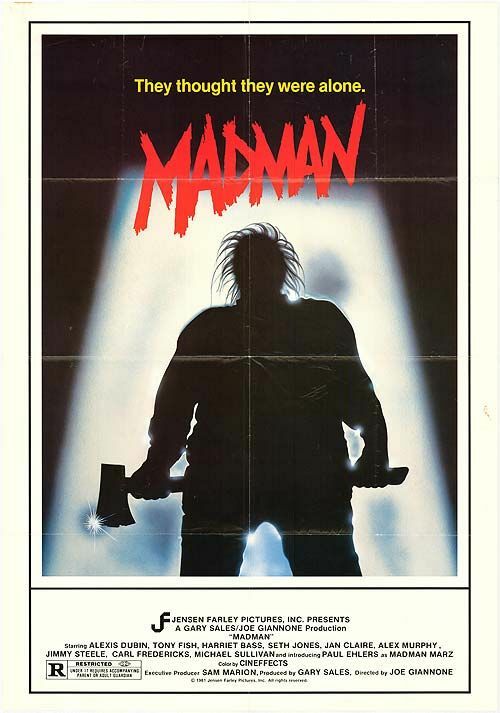 Now it may seem “Madman” is your run of the mil 1980s summer camp slasher movie and in a way your right but DAMN is it a fun movie. though many of the characters are not very interesting the kills in the film are pretty damn fun with multiple axe murders, slashings and even a decapitation via car hood. Not only are the death scenes fun but the film oozes with atmosphere as well, the whole film is at night so there is this moody blue tone and chilling windy vibe to everything not to mention a scene with a very creepy dilapitated farm house, one can almost say that Madman is a summercamp slasher movie that can be viewed in October! given its atmosphere. and Finally the killer himself Madman Marz is a good one, this hulking beared mongoloid of a farmer is almost the epitome of the term “mongoloid slasher” among horror fans.